The Connemara marble that is featured in these shamrock earrings is the only natural green marble in the world; fittingly, Connemara marble is only found in Ireland. 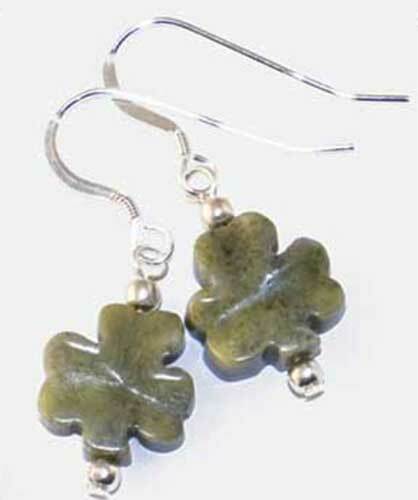 These shamrock earrings feature carved Connemara marble. The Connemara marble earrings are a drop style on sterling silver fish hooks that measure 1/2" wide by 1 1/2" tall to the top of the wires. The Irish earrings are made in Kilkenny, Ireland by All That Glisters and they are gift boxed with shamrock and Connemara marble history cards, complements of The Irish Gift House. Large Connemara marble shamrock pendant would be suitable for either a man or a woman.